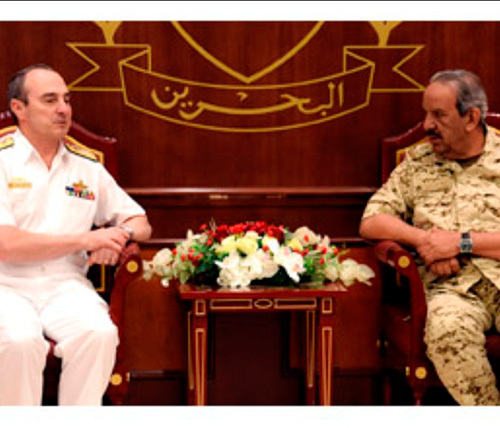 Bahrain Defense Force (BDF) Commander-in-Chief Field Marshal Sheikh Khalifa bin Salman Al Khalifa received the Commanders of Australian Combined Operations Admiral John Johnston and Australian Forces in the Middle East V. Admiral Jaimie Hatcher, and their accompanying delegation. The two sides reviewed the bilateral friendship and cooperation ties and means of further boosting them, according to Bahrain News Agency (BNA). General Hassan Mohamed Saad the Director of General Command Headquarters, General Abdullah Hassan Al Nuaimi the Inspector-General and (Naval) General Mohamed Hashim Al Sada, were also present. For his part, the Chief-of-Staff of Bahrain Defense Force (BDF) Lieutenant General Dhiab bin Saqr Al Nuaimi attended the opening of the mobilization drill “Dawn of Storms 22” at the Royal Bahrain Naval Force (RBNF) which is performed by RBNF with the participation of a number of BDF weaponries, the Interior Ministry’s Coastguard and the National Guard. The military exercise is part of the “Dawn of Storms” series of drills aimed at training, grooming and raising the competence of the participants. The exercise includes preparing and planning for naval combat operations, boosting combat readiness and carrying out training operations on command and control procedures. The drill aims to enhance the efficiency of RBNF weaponry and boost the performance of its affiliates as part of BDF development and modernization strategy to bolster the military capabilities of protecting sea borders, fighting smuggling operations, infiltration and sabotage. The opening of the military exercise was attended by Assistant Chief-of-Staff for Human Resources Major General Sheikh Ali bin Rashid Al Khalifa and BDF senior officers.